ASLLI-160 | Size: 15 ml / 0.51 fl. oz. The cream is an age-diffusing solution, offering instant rejuvenation and skin renewal. Designed for those who want a daily age-defying regimen. 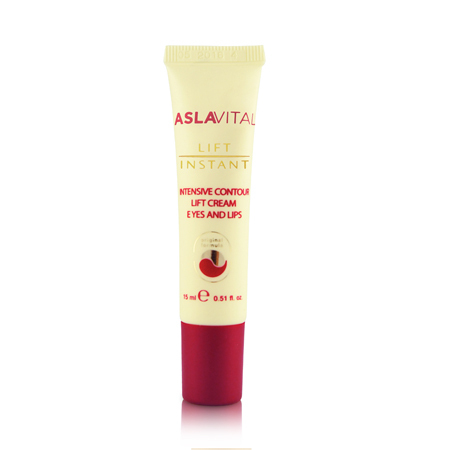 A gel-cream nourisher for eyes and lips, the most fragile areas of the skin. Boosts skin’s natural collagen production, fights against crow’s feet, dark circles and pouches. Soothes, smoothes, increases elasticity and protects against free radicals damage. INGREDIENTS: AQUA, SQUALANE, METHYLSILANOL MANNURONATE, CAPRYLIC/CAPRIC TRIGLYCERIDE, CETEARYL ALCOHOL, CETEARETH-20, PROPYLENE GLYCOL, ETHOXYDIGLYCOL, GLYCERIN, FERULIC ACID, PEG-40 HYDROGENATED CASTOR OIL, ORYZA SATIVA BRAN OIL, ALCOHOL, ACMELLA OLERACEA EXTRACT, GLYCERYL STEARATE, DIPALMITOYL HYDROXYPROLINE, SIMMONDSIA CHINENSIS SEED OIL, DIPROPYLENE GLYCOL, BOSWELLIA SERRATA RESIN EXTRACT, SODIUM POLYACRYLATE, HYDROGENATED POLYDECENE, TRIDECETH-6, CALENDULA OFFICINALIS FLOWER OIL, OLUS OIL, TOCOPHEROL, RETINYL PALMITATE, TOCOPHERYL ACETATE, DIMETHICONE, PHENOXYETHANOL, ETHYLHEXYLGLYCERIN, MAGNESIUM ALUMINUM SILICATE, TETRASODIUM EDTA, SODIUM HYDROXIDE, PARFUM, BHA, SORBIC ACID. I like its texture. It very light and soft. Looking foward to seeing its effect over a period of use. is very good! very well absorved and leaves the skin soft. My eyes look young and fresh within few week.rnThank to this incredible product.......Love it Thx. I have been using this product with lift instant cream for a long time and love it. Similar texture to the cream and little lighter. Use it around eye and around mouth. My wrinkles around eyes seems to be reduced already. Apply it with your fingertip with light tapping ( do not rub in). I am 48 and this eye cream is rich enough for my age.